In fantasy football, there are some new trends that I enjoy writing about: dynasty leagues, and individual defensive player leagues. This weekly column will combine two of those by discussing two young IDPs. I will give my scouting thoughts on how they played a particular week. 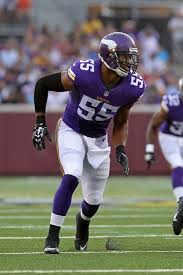 Today I will be discussing Vikings rookie linebacker Anthony Barr and Jaguars third year defensive end Andre Branch. LB Anthony Barr, MIN- The former running back got selected as the 9th overall pick in the 2014 NFL Draft. He is highly athletic and is mostly used in the strong side linebacker spot. This means his first responsibility is dealing with the tight end. Many NFL teams tend to run to the tight end side, so Barr deals with more blockers on the majority of plays. This young backer is a solid tackler who delivers hard hits, but still has moments of being raw due to processing all the information to make the play. His rawness is more evident on running plays, because he tends to over-pursue and get blocked out of the play a bit too much for a man of his fluidity. Barr is more natural in the passing game. He finds the ball quicker, tackling the catch. The backer can provide a good amount of pressure when rushing the signal caller. He has quick striking, powerful hands and sheds blockers on his way to the quarterback. Barr can rush the passer from the outside, but might be better stepping up into the one or three gap (between the center and guard or guard and tackle) swimming through contact. When he is rushing, the young linebacker makes sure he times his jumps and gets his arms up to knock the pigskin down. On a few plays, Barr was the designated spy on quarterback Aaron Rodgers. This was to prevent Mr. Discount Double Check from gaining additional yardage on a sloppy field once the pocket collapsed and the young backer did a decent job. At this point in his rookie season, Barr is a better LB3 with upside when Chad Greenway is on the field. I would not want to rely on him more than a depth linebacker in 2014, but that should change beyond that. Barr should grow into a dominate defender with even more value in sack heavy scoring. DE Andre Branch, JAX- This third year defensive end is causing a few defensive waves this season despite his non-starter status. He gets good initial pressure, usually knocking offensive linemen back into the pocket. Branch got employed on a few stunts where he crashes the inside gaps while the defensive tackle flies to the outside gap where he was normally responsible. These create more inside pressure, but did not result in any production spike directly for Branch so far. The defensive end uses spin moves with alternative bull rushes to get free trying to smash opposing quarterbacks. It is fair to say that Branch is a better pass rusher than a run defender. He isn’t used in many first downs or short yardage situations. Branch got good leverage, and applied pressure freeing up another defender to strip the ball from Ben Roethlisberger. The defensive end pounced on the ball which stalled a deep Steelers drive. Branch should be owned in sack heavy and deeper leagues, but is not a consistent enough tackler for more than that. Perhaps after the Jacksonville secondary has a chance to gel, he will be more effective with additional time to get the quarterback. If you enjoy the article, please use the PayPal button at the bottom of the page. The site is completely free and takes many hours each week to produce. You can follow me on Twitter @AndrewMiley or @Dynasty_Blitz. Thanks for reading.